Dawn Approach ran out a superb winner of the Qipco 2000 Guineas at Newmarket to give trainer Jim Bolger his first win in the mile Classic. Unbeaten during a champion juvenile season, the Godolphin-owned 11-8 favourite held a perfect position throughout under Kevin Manning, alongside his market rival Toronado, and was poised to strike as Glory Awaits led with a furlong and a half to run. Richard Hughes was sending out distress signals on Toronado once Dawn Approach kicked on and it was left to the 150-1 outsider Glory Awaits to chase him home, five lengths adrift. Van Der Neer grabbed third spot on the line. Bolger said: "He was very impressive, we're very happy with him and he galloped right to the line. 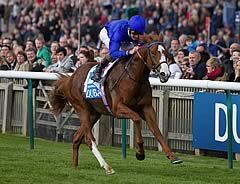 "I don't know about the Derby, Sheikh Mohammed and myself said we would sleep on it and take it from there. If he wants to go, I'd be very happy to. We have to see how he comes out of this, but he's hardy and I'm sure he'll be fine. "I'm sure he can only improve from here as that's his first time on a racecourse this year." Manning added: "He's a very special horse, he's done it very easy and travelled very well throughout the race. I didn't want to get there too soon and when I asked him to quicken, he just picked up." When asked about the colt's ability to stay the mile-and-a-half trip in the Investec Derby, he went on: "It's another day's work. He's got a fantastic temperament, he was cruising here and he's very easy to switch off in a race. If he's going to get the trip, he's got the temperament for it." Godolphin snapped up a share in the colt from the trainer for an undisclosed fee after he won the Coventry Stakes at Royal Ascot last June and Sheikh Mohammed, the mastermind behind the operation, was making his first trip to the track since the Mahmood Al Zarooni drugs scandal. He said: "I'm very, very happy to come and see a good horse winning the Guineas and I think he is a great horse." Sheikh Mohammed was asked if he had thought about bypassing a trip to Newmarket in light of former Godolphin trainer Al Zarooni's eight-year ban after admitting administering anabolic steroids to 15 horses in his care, and replied: "I always face a challenge." 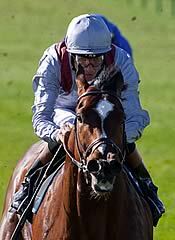 Richard Hannon jnr had no real excuses after Toronado's failure in the Qipco 2000 Guineast. Connections had been bullish about the colt's prospects before the Classic and he travelled alongside eventual winner Dawn Approach for most of the race before failing to pick up in the closing stages, losing third place to stable companion Van Der Neer on the line. "It looked like developing into a match a furlong out but our horse didn't really come home, it was very disappointing," said Hannon jnr, who is assistant to his trainer-father. "Obviously the winner is a very good horse and well done to Jim Bolger, he's pretty good, isn't he? "Hughesie said he felt like he's been in a two-mile chase, he felt legless, he was just going up and down. "Whether there's something on him, I don't know. We'll do all the tests to see if anything is wrong but apart from that, I didn't see too many excuses to be honest. He was beaten by a very good horse fair and square."